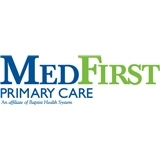 MedFirst at Overlook (San Antonio) - Book Appointment Online! If you are a New Patient, please fill out our New Patient packet and bring it with you to your first appointment. Also please arrive 30 min early so we can complete your registration. Remember to bring in any medications that you are currently taking. We are not accepting any new ADD, ADHD, and chronic pain patients. MEDICAID PATIENTS: We are not contracted to provide physicals nor do we provide vaccinations of any kind. Thank you and we look forward to seeing you soon. My first visit to this office and I am glad I scheduled my appointment with this doctor; easy to talk to, asked the right questions and gave me an opportunity to ask, explain and address all my concerns. Erica always takes time to explain what treatment, home remedy or Rx, would work best for me. She is thorough and does not rush me. I appreciate her candor. Very good listener. Seems to really care about her patients. Staff was very nice as well.